AEC Daily is an educational website specializing in 24-hour access to building product information, industry news, educational opportunities and discussion forums for architects, specifiers, engineers and construction professionals. Course development has been funded by an NCMA Research and Education Foundation grant. 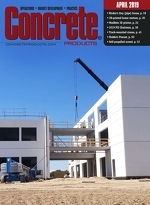 The course can be accessed by searching National Concrete Masonry Association at www.aecdaily.com. The ACI Foundation’s Concrete Research Council is accepting through December 1 proposals from parties seeking assistance for projects that further the knowledge and sustainability of concrete materials, construction, and structures. Among proposal and funding parameters: Topics are encouraged from all areas of concrete research; up to $50,000 may be approved per project for direct costs; due to a 15 percent research organization overhead cost limit, the ACI Foundation may award up to an additional $7,500 to fund indirect costs; an ACI technical committee must support the research concept and participate in an advisory role to the principal investigator; an individual researcher can serve as the principal investigator or co-principal investigator on only one proposal submitted; and, industry partnering and project cost sharing are strongly encouraged. Principal investigators will follow the Council’s RFP Application Guide. Selection of awarded projects and notifications to principal investigators occurs after the American Concrete Institute Spring Concrete Convention and Exposition. Additional information can be obtained from ACI Foundation Director Ann Daugherty, [email protected]. Information on the last year’s awarded projects and research products is posted at www.acifoundation.org/research. The California-based Charles Pankow Foundation has appointed Anne Ellis, P.E., FACI, F.ASCE, as executive director, effective this month. Founder of Ellis Global and past American Concrete Institute president, she previous served as a special advisor to the Board to rally support for collaborative innovation in the architecture, engineering, and construction industries. The recently chartered Global Cement and Concrete Association, London, has enlisted as new members Buzzi Unicem, Cementos Argos and Titan Cement—the parent companies of three major North America producers—and named Portland Cement Association an associate member. They join a charter-member roster that includes Cemex, CRH, HeidelbergCement, LafargeHolcim, Taiheiyo and Votorantim. “GCCA was set up to provide the authoritative global voice for this essential sector. With every new member, that voice becomes even stronger,” says GCCA President and CRH Plc CEO Albert Manifold. The Post-Tensioning Institute has opened its 2019 Project Awards cycle, accepting entries through year’s end. PTI Project Awards are presented every two years and recognize excellence in post-tensioning applications in building, bridge, parking structure, slab-on-ground, industrial/special application, and repair/rehabilitation/strengthening categories. Any structure that uses post-tensioning as a structural component, was constructed or rehabilitated in the past seven years, and not entered into the 2017 PTI Project Awards is eligible. Entries may be submitted by the owner, architect, engineer, contractor, or post-tensioning supplier. Winning projects will be selected by a jury of distinguished industry professionals, and entries are judged on creativity, innovation, ingenuity, cost-effectiveness, functionality, constructability, and aesthetics. Awards will be presented during the 2019 PTI Convention in Seattle. Entry forms and additional details are posted at www.post-tensioning.org/events/awards/projectawards.aspx.